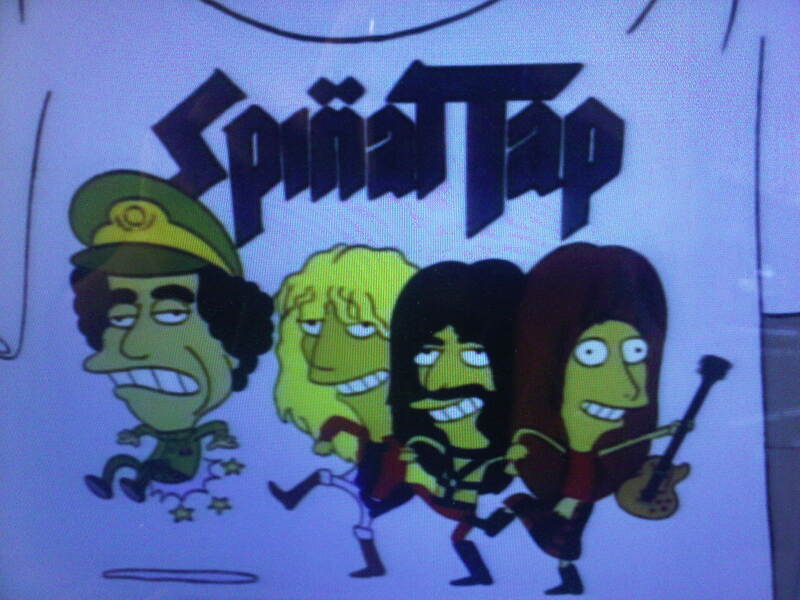 Mu'ammar al-Qaddafi got his backside kicked by Spinal Tap on The Simpsons two decades ago. Funny how his Matt Groening rendering looks a lot like Libyan revolutionary street art. New York- Watching my old Simpsons DVDs the other day, I caught this quick gag where a tout tries to sell Bart a Spinal Tap t-shirt where the band is kicking Mu’ammar al-Qaddafi’s backside. This art presaged that of the Libyan revolutionaries by a good nearly 20 years. The Qaddafi shirt appears in The Otto Show which was broadcast in April 1992 at the end of the show’s third season. 2011 was one crazy roller coaster of a year. I want to thank some of the people that made the year both possible and memorable: Faisal my driver in eastern Libya who took me as far as Ras Lanuf and invited this strange Westerner who didn’t eat meat into his home for lunch, watching the circus that was Libyan state TV, and letting play with his Kalashnikov which he procured in case things got really bad. My old San Diego friend Brad, a reformed Orange County punker turned family man/junior diplomat at U.S. Embassy Bahrain and Nabeel Rajab for giving me his thoughts on the grim human rights situation in his besieged country. In Addis Ababa I want to thank my friend Carlo who introduced me to the last Italians in Ethiopia at the Buffet de le Gare near the defunct railroad station. Sorry we never did the trip to the Somali border mio amico! Next time… Khalid and the very hospitable Amazight (Berber) rebels in Nalut in Libya’s Jebel Nafusa. I hope the war really is over for you. Kenny in Barcelona who rescued me on the way back from North Africa when there was no place to stay in the city on a hot summer night. And Kostas and Veronika at Caveland on Santorini, I hope to come again! I miss those pups. Caroline and all the staff at the American Embassy in Paris closed out my year very nicely and for that I am grateful. No one could have ever predicted all of the things that took place this last year. The world began to reorder itself in a messy and violent way. The status quo became unbearable to the point of both peaceful and armed revolt. The drone war escalated, the neocons are trying to stage an awkward comeback and a host of other negative trends mean we are in no way out of the proverbial woods. But people were and are willing to fight and die for their freedom which came at a terrible cost in Libya (and continues unabated in Syria). Plenty of dictators-yes I’m talking about you Central Asia-and monarchs-GCC, Jordan, Morocco-still stand around the world. The clock is ticking for Bashar al-Assad. Plenty of issues seek to be ironed out in 2012 in the European Union to say the least. God only knows where the next crisis will arise in the coming year and anyone who says they do is likely a fool. Happy New Year from TWD!! !